The new MS2N Synchronous Servo Motor is Tectra Automations’ latest product offering to break new boundaries in the Electric Drives and Controls industry. 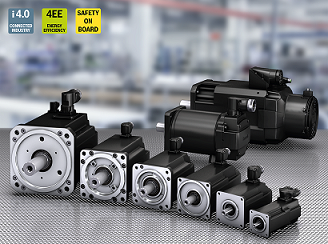 The new MS2N servo motor range combines high dynamics with compact dimensions and excellent energy efficiency, with more torque, higher speeds, a practical single-cable connection and extensive options for the highest servo mechanism requirements. The new MS2N includes over 50 motor types in 6 motor sizes, 5 motor lengths, and more than 20 fully configurable options, covering maximum torque up to 360 Nm and maximum rotational speeds up to 9 000 rpm. It is 30% smaller than its predecessor, has a low rotor inertia for maximum dynamics and high rotor inertia for optimal adaption motor masses. It comes equipped with a quick locking mechanism which is simple, practical and reduces installation time. In the MS2N product line, intelligence progresses all the way up to the motor by storing the individual readings of every single motor as well as the saturation and temperature data, into the motor data memory. The MS2N Servo Motor comes equipped with a certified SIL3 Encoder, which allows for maximum level of safety for all safety functions. This includes safe absolute end position which replaces the hardware limit switch by software, 31 configurable safe cam areas, reduced commissioning due to semi-automatic support and PC-free device replacement when servicing. The motor has a maximum torque error range of 5%, which compares very well with the standard torque error range of +5 and -35%. Applications in which this product may be utilised include force and pressure control in robotics and production machines and condition monitoring, like detection of production faults or bad parts. Tectra Automation, a Bosch Rexroth South Africa Company, is a leader in the supply of automation solutions, providing leading technology, expertise and product support across Africa.